Why study Japanese at Dickinson? Ellen Kelly working with a student. 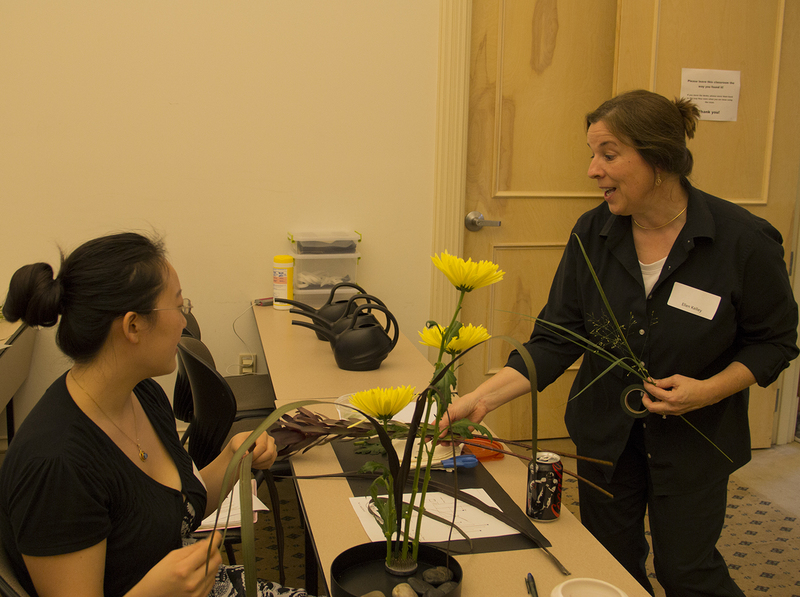 On October 2, 2013, a small Ikebana workshop was conducted by Ellen Kelly, a member of Harrisburg Chapter, Ikebana International. 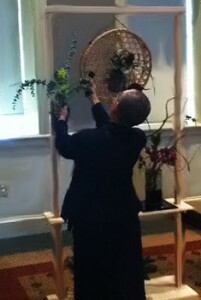 Ellen Kelly lived in Japan for over 5 years and fell in love with Ikebana. She was excited to share this part of Japanese culture with the students. Students were taught about the origins of Ikebana and were guided through creating their own pieces. Funding for the workshop was generously provided by the department of East Asian studies, and the Luce Foundation. This entry was posted in Ikebana Flower Arranging on December 19, 2013 by joshuae. Ikebana (lit. “flowers kept alive”) originated in sixth-century Japan as an expression of the beauty of nature; originally, Buddhist priests created the artful arrangements as offerings to the spirits of the dead. By the mid-15th century, ikebana was officially recognized in Japan as a high-art form, but it would be two more centuries before the merchant classes were permitted to practice it. Today, more than 2,000 schools of ikebana are registered with the Japanese government; Anna Nakada is a master of the ichiyo (“one leaf”) school, which takes into account the environment in which the arrangement will be displayed and the personal expression of the arranger. Ikebana Master Anna Nakada arranges flowers during a demonstration highlighting an ancient form of Japanese art. The flowers and branches she used were culled from the Dickinson campus. Working in the Stern Center Great Room before a live audience, Nakada created several arrangements, using natural materials she’d gathered on campus with help from Randall Nenninger, manager of grounds and landscape services; Arborist Mike Shaffer; and Master Gardener Anne Dailey. 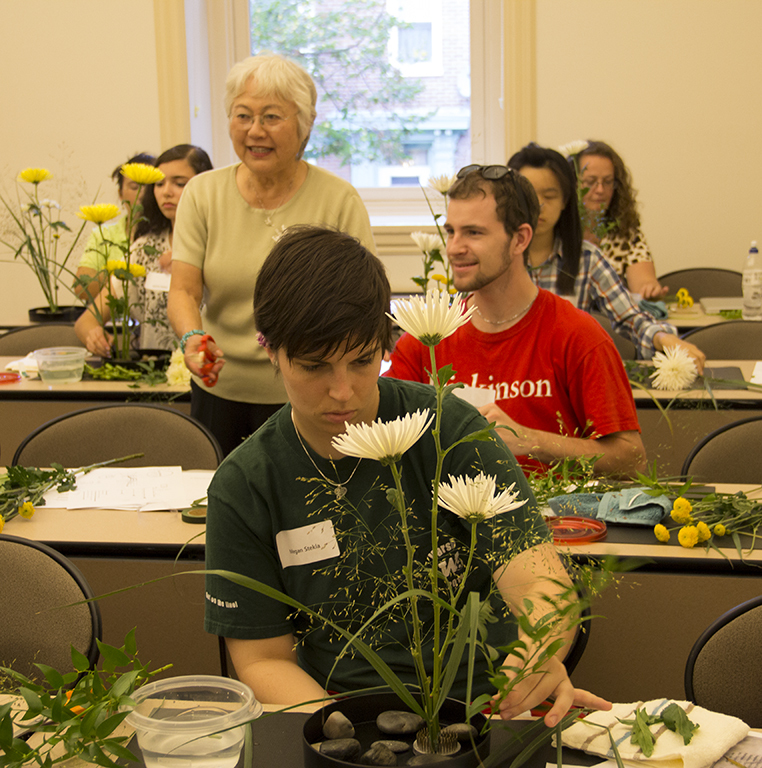 Her two-hour demonstration, sponsored by the Department of East Asian Studies, was accompanied by an Waidner-Spahr Library exhibition of arrangements created by members of the Harrisburg chapter of Ikebana International. Nakada also fashioned a special arrangement to be included in a current exhibition at The Trout Gallery titled The Floating World: Ukiyo Prints From the Lauren Rogers Museum of Art. As she created her ephemeral sculptures, Nakada explained that each piece in the arrangements represented an element of nature. She also spoke about the role of asymmetry in Japanese art; the proper composition of color, depth and height; the interplay between tradition and personal expression; and the discipline it takes to draw out expressions of nature that are as economically eloquent as nature itself. This entry was posted in Japanese Film Series on December 19, 2013 by joshuae. Japanese language students can learn the centuries-old art of sushi-making while at Dickinson. 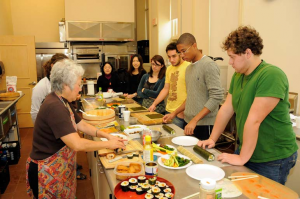 Divided into stations, the students learned how to create maki by topping seasoned sticky rice with fish, vegetables and other ingredients and then rolling it all up in sheets of dried and pressed seaweed or collard greens. Trout Gallery attendant Satsuki Swisher (left) demonstrates the art of sushi-making. The class has been taught by Satsuki Swisher, a retired library cataloging coordinator and Japanese language professor who now works in The Trout Gallery and who learned to create sushi as a youngster. The secret to perfect sushi, Swisher advised, lies in the rice, which must be cooked properly and seasoned with rice vinegar, sugar and salt. As the students sampled the sushi they’d made, Swisher smiled in approval. “I think the students are doing wonderfully,” she said. 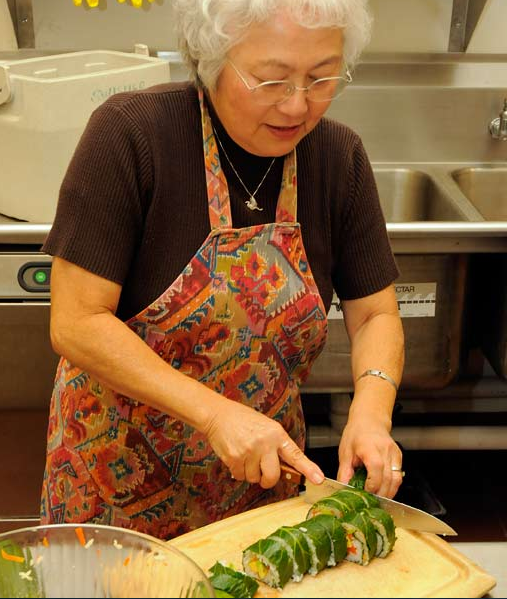 Trout Gallery attendant Satsuki Swisher demonstrates the art of sushi-making. This entry was posted in Sushi Making on December 19, 2013 by joshuae. 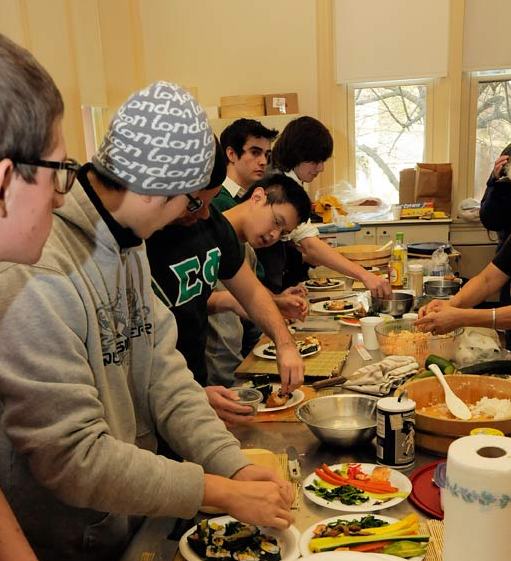 The Japanese Program at Dickinson is Multidisciplinary. At Dickinson, the East Asian Studies major focuses on China and Japan but with increasing attention to the broader East Asian and global contexts of these two civilizations. Students explore East Asia from multiple perspectives: from ancient origins to contemporary realities through the study of history, society, politics, business and economics, literature and culture. The major is language-based (Japanese or Chinese is required through the intermediate level) and multidisciplinary in the many directions for in-depth analysis and reflection offered to students. Students gain broad and focused knowledge on historical as well as modern topics in Japan. Courses are offered to engage students’ interests and expose them to new areas of studies. The East Asian Studies department offers various extra-curricular activities throughout the semester so that students can explore various Japanese activities such as sushi making, ikebana flower arranging and tea ceremonies. This leads me to another key development in our department, our Luce Foundation Grant to encourage pedagogy on Asia and the Environment. Last semester was the first semester of support from the grant. In addition to various lectures, we were able to invite an ikebana master to campus, have a workshop on bonsai and travel to a bonsai exhibit. The grant also allowed us to subsidize our successful summer program “Seismic Japan.” This was a unique opportunity to combine the sciences and the humanities to look at both the science and the culture of earthquake in the country. This entry was posted in Why study Japanese at Dickinson? on December 19, 2013 by joshuae. The emphasis in these courses is placed on polishing and refining the students’ language skills. Emphasis is placed on covering more sophisticated materials such as newspapers, magazine articles, film and literature. Prerequisite: 232 or permission of the instructor. This course usually follows 361 Advanced Japanese II. This entry was posted in 362 Advanced Japanese II on November 22, 2013 by joshuae. Prerequisite: 232 or permission of the instructor. This entry was posted in 361 Advanced Japanese II on November 22, 2013 by joshuae. The emphasis in these courses is placed on enhancing the students’ fluency and acquiring increasingly creative skills through composition, oral presentation and discussion. Prerequisite: 212 or permission of the instructor. This course usually follows 231 Advanced Japanese. This entry was posted in 232 Advanced Japanese on November 22, 2013 by joshuae. Prerequisite: 212 or permission of the instructor. This entry was posted in 231 Advanced Japanese on November 22, 2013 by joshuae. The aim of these courses is the mastery of the basic structure of Japanese language and communicative skills. The student will have an opportunity to get to know more of Japanese culture. Prerequisite: 102 or permission of the instructor. This course follows 211 Intermediate Japanese. This entry was posted in 212 Intermediate Japanese on November 22, 2013 by joshuae.